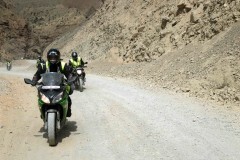 Travel to the cold, desert kingdom of Ladakh and explore mysterious corners and isolated villages on a 15-day motorbiking tour. 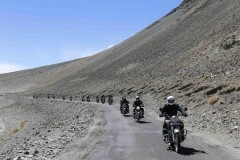 You'll visit the multi-coloured lakes of Pangong and Tso Moriri, travel to the sand dunes of Hunder and Sumur, ride through high-altitude passes of Khardung-La and Chang-La, visit the historic monasteries of Thiksey and Diskit, apart from a range of other exciting adventures. Your adventure begins from the city lights of Delhi. 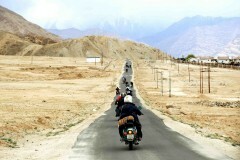 As you travel north, you'll visit the capital city of Srinagar and the historic city of Kargil before arriving at Leh. After exploring Leh and the sand dunes of the Nubra Valley, you'll spend a night by the famous Pangong Lake and return to Delhi, through the lush, green valleys of Manali. 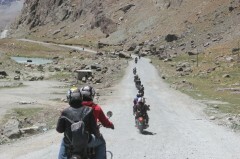 Continuing forward from Kargil, you'll keep riding east to reach the town of Leh, the capital city and the largest city of Ladakh. En route, you'll stop at the Sangam point, where the two rivers of Zanskar and Indus meet, and visit the Pathar Sahib Gurudwara, an important Sikh house of worship. You'll also visit the Hall of Fame, a museum dedicated to the Indian Army. Overnight in a hotel at Leh.